My reasons for selecting a particular novel aren’t always the most noble or inspired. I chose The Slap because I saw a commercial for the TV show version and Zachary Quinto is in it. I love Zachary Quinto, the series is based on a book, and boom: I must read it. The Slap, in spite of its hideous title, is actually a rather provocative and intriguing novel that finds itself punctuated by crude and graphic sexual encounters. Hector and his wife have a barbecue for friends and family. Hector’s cousin,Harry, sees a young boy swinging around a bat, about to hit his son. In trying to stop the boy, Harry slaps him. It’s basically the slap heard ’round the world, as it has a resounding impact on those gathered at the home. The novel initially caused a bit of a sensation over the idea of hitting someone else’s child. Tsiolkas’ portrayal is rather slanted, since the parents of the child are composed of a drunk and a hippy dippy woman intent on breastfeeding her son until he reaches puberty. Maybe it didn’t have this effect on everyone, but it made me want to slap the kid myself. 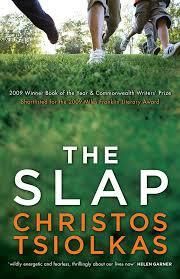 The Slap poses an interesting dilemma and forces the reader to consider it from eight different viewpoints. Hector is torn between his familial obligation to support Harry and his wife’s friendship with the child’s mother. The child’s mother has no identity outside of her son and refuses to acknowledge that the boy might have been in the wrong. Harry has anger issues but felt the need to act in the absence of parental supervision. Things get complicated fast, and everyone faces some sort of consequence from the event. I liked The Slap because it made me think about a lot of different things. For one thing, the novel reveals a society full of first -world problems. Back in the day, everyone used to slap their kids around. It was a part of life. Now, you can’t even touch your own kid, let alone someone else’s, so this one little smack is earth shattering to all individuals involved. It also gave an interesting view into Australian middle-class life, and I wonder how accurate Tsiolkas’ portrayal is. The teenagers all drink and do drugs to excess, and they don’t bother to hide it from their parents because their parents seem accepting of the behavior. All of the “adults” are engaged in some sort of adultery, and each sexual act is vividly and painfully described to the point that I physically cringed. Repeatedly. The adultery itself wasn’t as shocking as the general acceptance of it. When the person being cheated on learned of the adultery, it was treated as nothing more than a minor indiscretion. Basically everyone was accepting of everything, except for the slap itself. Overall, The Slap is thought-provoking and intriguing, and it makes readers everywhere want to seek out and slap random, misbehaving children.